The building site was well under construction when the City of Grand Rapids decided to add an engaging public space at this corner. The challenge was to design a public gateway to the Monroe North district of downtown Grand Rapids, within a narrow window of time in order to make modifications to designed building and site components prior to their imminent construction. The final design suggests a boardwalk, using plank pavers through a riparian area which includes rain gardens and infiltration basins. The intent was to evoke movement through the space, while embracing the relationship to the Grand River which is only a block away, and providing areas of respite for downtown visitors and employees. To achieve the desired paving pattern, three colors of 6” x 24” Promenade Plank Paver were used: Winter Marvel, French Grey and Midnight Sky in the Umbriano® finish. 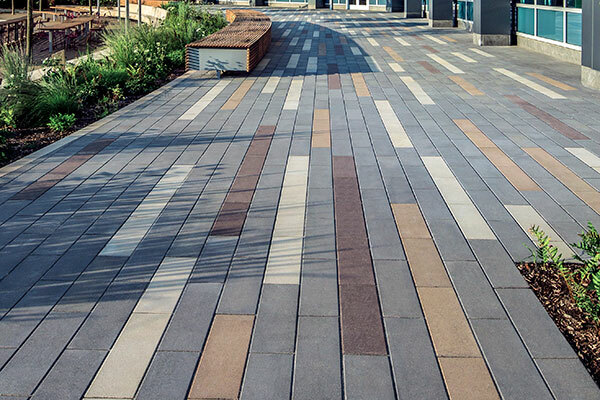 The finish resembles natural granite with the proprietary ColorFusion™ technology and the built-in EasyClean™ helps to ensure the plaza is easier to maintain.